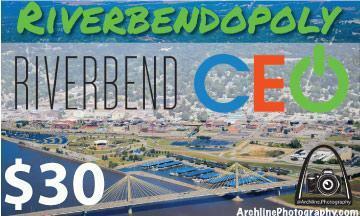 The Riverbend CEO is a high school business class made up of students from Marquette Catholic, Alton, and EAWR high school. These students spend two semesters learning from community business leaders the tools needed to start their own business. During the first semester, the classes work on a group project to help raise money. The proceeds from this project will provide startup money for the individual entrepreneur's business plan. The second semester is devoted to creating and pitching their idea to local bankers at the annual CEO Trade Show. The Marquette students, led by Mrs. Katie Sabolo created a business plan, sold advertisement to local businesses, designed their game board and now they are ready to sell the Riverbend version of the classic Monopoly game. The group is selling the game for $30 and are now taking online orders.